At age 72, legendary trainer Ray Arcel comes out of retirement to coach world-class Panamanian boxer Roberto Durán. Arcel becomes a mentor to the ferocious fighter, convincing him that winning ultimately comes down to strategy. 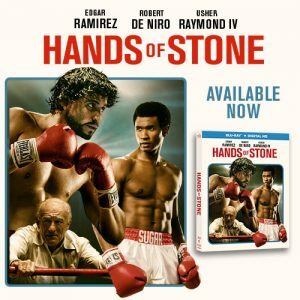 Knock out cast starring Édgar Ramírez, two-time Academy Award winner Robert De Niro, Usher Raymond IV, Ruben Blades, and Ana de Armas – Hands of Stone on Blu-ray, DVD and Digital HD tomorrow.